Do you ever ask yourself how you want to live as you age? The world’s population is aging, and by 2050 there will be more seniors than there are infants in the world. Here in Hawaii, we rank first in the nation for seniors 85 and over. How many of them have choices on how or where to live? At a recent Environments for Aging conference, attended by many forward-thinking leaders, a global, national and local motivation for change and inspiration was evident. Nick Buettner of Blue Zone Expeditions elaborated on the concept of Blue Zones – locations where a high percentage of people enjoy remarkably long, full lives well past 100 years of age. In these areas, walking is the main means of transportation; people eat locally grown, organic produce; and social norms bring people together in supportive groups. These environments are extremely healthy and sustainable, and the lifestyle generates activity. The trend for senior living design in the U.S. is to create homelike atmospheres with specialized care for the individual. On a tour of Orange County’s award-winning Continuing Care Retirement Community, “Walnut Village,” it was impressive how a village-square-inspired community could feel so cozy. Residences wrap around a central courtyard with shops and activity spaces lining the perimeter, from a putting green and indoor pool to artists’ studio and salon. The design is intended to inspire healthy social interaction and activity. Beacon Hill Village, in Boston, Massachusetts, is a virtual community where seniors take care of themselves and each other instead of being “taken care of.” In 2006, the Seniors of Beacon Hill Village formed a nonprofit organization, which hires its own staff of service providers and recruits volunteers.They self-govern, make all their own decisions and live in their own houses and apartments. The organization presents a true model of how to “age in place,” and it is so successful it has been replicated in at least 100 other locations across the nation. 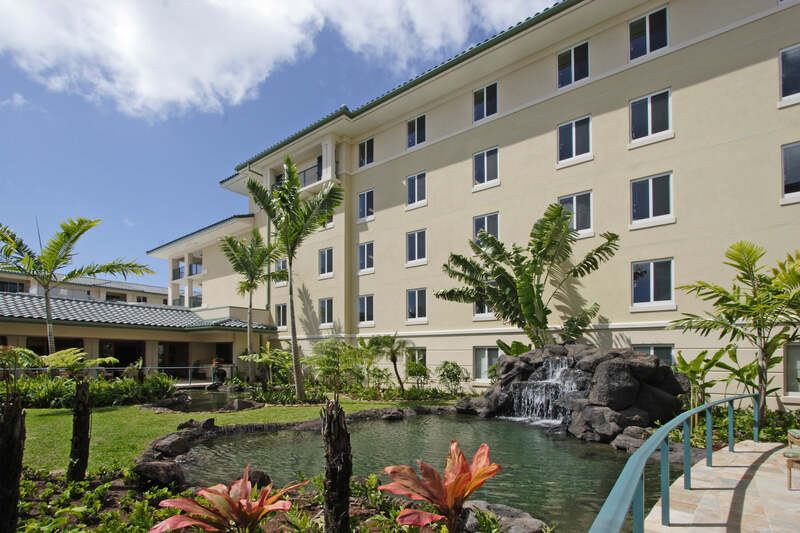 Hawaii has senior living residences like Walnut Village that incorporate hospitality design and provide a continuum of care. The Kahala Nui Retirement Community, built in 2004, for example, provides 393 living units and remains today the largest senior living residence in Hawaii. Similar developments have been cropping up all over Oahu’s neighborhoods, combining resort-style amenities and services with assisted living and skilled nursing services into a single high-rise. Looking at senior living housing locally and nationally, however, it is apparent Hawaii can do more. Looking towards the future, the message is clear: We must reinvent senior living and recognize that one size does not fit all and find creative ways to support the needs of unique populations. Let’s envision a place with an abundance of fruit and vegetable gardens, walking paths around a transit-oriented community, stimulating exercise and socialization. Let’s envision multi-generational housing, so that our seniors can nurture their grandchildren, and mixed-use inter-generational condominiums with affordable senior housing. Most importantly, let’s empower our seniors as the decision-makers in creating the community they want in order to thrive. Mariel Moriwake, AIA, CDT, LEED-AP, is a designer for Architects Hawaii Ltd.